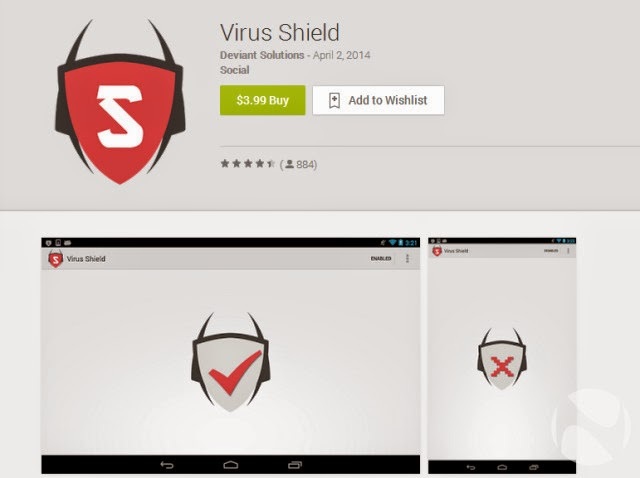 Google has removed Virus Shield, an anti malware Android app from the Google Play Store for scamming Android users.. According to Android Police, the Virus Shield is not protecting any of the 10000+ Android users who had downloaded it and were ripped of $3.99 they paid for using it. The number of users is huge as the app was launched just two weeks ago on March 28, 2014. The price and the claims made by "Virus Shield" are the two factors that boost download. At just $3.99, "Virus Shield" claimed that it can protect Android Smartphone users from viruses, malware and spyware, and can even improve the speed of phones. But the great work done by Android Police, made this as the number 1 Scam app for which users are paying and getting nothing in return. Android Police analyzed the code of the "Virus Shield" and confirmed that it was “totally and completely devoid of any security benefit.” It just changes the red X mark within its logo to red Checkmark to make user believe that they are now protected and their phone is safe. But in reality, it’s just the game of graphics. So, those who had installed "Virus Shield" on their Android smart phones should immediately uninstall the app. Red X mark change to red Checkmark to fool users. With this scam, the voice are raising against the Google Android loopholes in allowing scam apps to get listed and also get ranked no. 1. There is a need to have strict apps scrutiny before they are allowed in the Google Play Store. It’s good that Android is open for all, but allowing this type of scam app to be listed in Google Play Store is not good for Android users. Google should follow the footsteps of Apple in scrutinizing an app to get approval for listing in iTunes store; else Android users will get ripped off from their money and maybe their privacy and security.